From the fourth series, so regrettably no Richard Beckinsdale. A Rising Damp story told through a trio rather than a quartet is unfortunately lopsided. Rigsby and Miss Jones have both got proper things to do, placing a lonely-hearts advertisement and replying to it in a comedy of mistaken identity through letters that could, with minimal alteration, have been performed 400 years earlier. 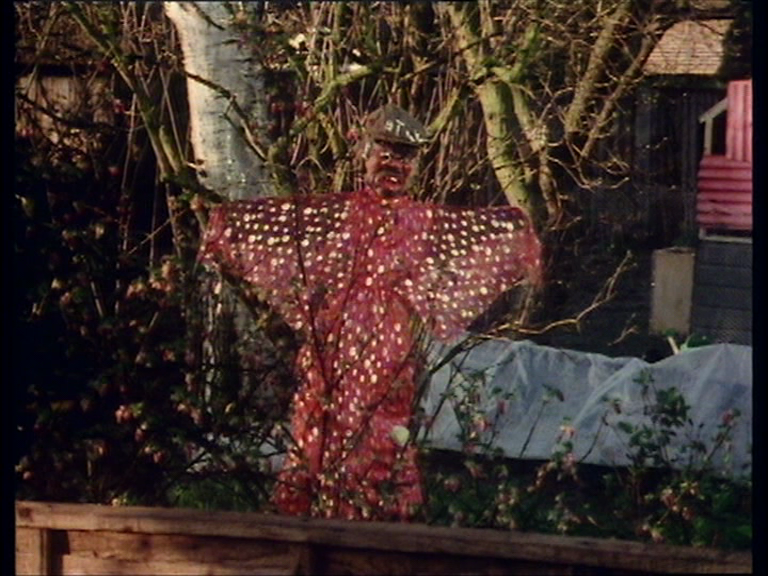 But poor Don Warrington only appears in the first scene, acting as confidante and advisor to Rigsby, then Miss Jones. Apart from underusing one of the leads, the episode fails to follow up on the interesting possibility of Miss Jones discovering that Philip knew the true identity of her ("early 40s, company director, interested in culture") blind date. She'd certainly have had good cause to be cross with him! Rigsby has acquired a set of approximate 'fine living' clothes by the time that he turns up at the country pub for his assignation. It would be interesting to learn how he came by them. A newly married couple turn up, both wearing pink carnations and enjoyable but not-terribly-surprising misunderstandings ensue. 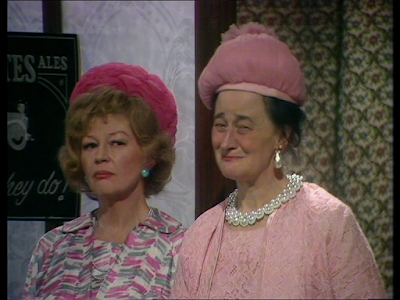 Things perk up with the appearance of the groom's gorgon mother in law, ideal casting for Joan Sanderson. She's not nearly given enough funny stuff to do, but no actress was ever better able to exclaim, “You vulgar little man! How dare you? I’ve never been so insulted in my life.” with conviction and ringing diction. 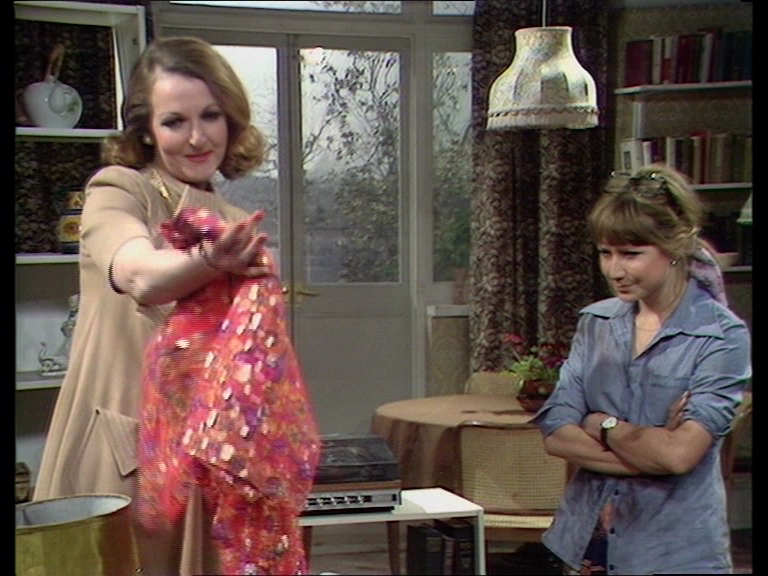 MARGO: I just came round to apologise. I'm so sorry, Lady Truscott. I really am desperately sorry. MARGO: This is my husband Jeremy. Several different interesting strands plait together well in this episode. Barbara befriends an aristocrat, Lady ("Call me George") Truscott (Angela Thorne), who coerces her into doing a lot of public speaking for good causes. Margo is upset to see the natural order of things upset by such a highborn woman befriending the Goods and not her. 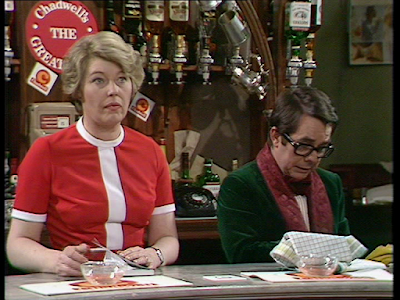 Tom's construction of a new chicken shed is disrupted by Lady Truscott's calls upon Barbara's time. The script does a good job of keeping everyone sympathetic. Tom is (thankfully) entirely supportive of his wife's unexpected aptitude for public speaking. 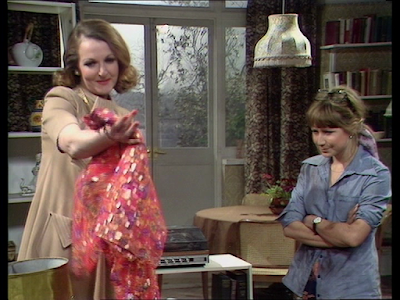 Despite Margo's unreasonable expectations, the two couples' friendship isn't placed under any stress - There's one very useful line when Barbara says to Margo, Well why don't you just invite Lady Truscott over? It doesn't get a laugh, but it does direct the audience how to most constructively find the situation funny. The scenes with Tom and the chickens are light visual relief from the main storylines, but create maybe the funniest moment in the whole of The Good Life involving beast or fowl, when the rooster escapes and hops onto a bus to Kingston. The episode's initial shot of a coop of new chicks ("those canaries" according to Margo) also engenders a good mood on the part of the viewer from the outset. An Upstairs, Downstairs reunion in this episode, with Simon Williams joining Alderton and Collins in one of Wodehouse's golfing stories. As usual in Wodehouse adaptations you lose much of the prose style but keep the plot, making the experience pleasant to watch rather than harmonious to read. Along with some enjoyable star performances (especially Pauline Collins' dim aristocrat), this story's highlights come through atmospheric coastal location filming, and an ambitious attempt to show progress of the climactic golf match through cinematic montage and dissolves. Its very slightly jarring having a studio audience in a literary adaptation, even of a sunny-natured comic tale, as it doesn't share quite the same structure as sitcoms or sketches. Without conventional jokes or reversals of situations it feels like the laughter is a bit randomly distributed. Although it does create a cherishable moment when a Pekingese dog arrives and fetches the golf ball at the final hole, causing one excited audience member to exclaim, "How sweet!" MR LUCAS: In two minutes I won't be free. CAPTAIN PEACOCK: Why not, Mr Lucas? LUCAS: Cos it's my coffee break. PEACOCK: It will not be anybody's coffee break until I say so. LUCAS: It must be frightening to have so much power, mustn't it, Mr Humphries? MR HUMPHRIES: Let's hope he uses it for good. There's more recognisable workplace politics dramatized in this edition of Are You Being Served? than I'm accustomed to, and it does the comedy a power of good. 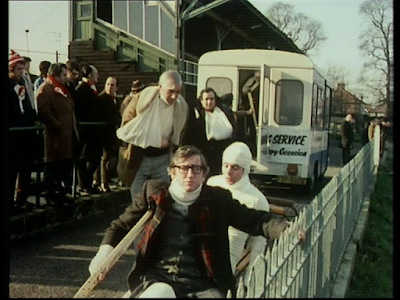 Mr Rumbold is sent away to Swansea for a month's sales seminar (A month? That's quite some executive jolly. No wonder Grace Bros is struggling...) and appoints Mr Grainger in his place, over the head of a peeved Captain Peacock. In a highly enjoyable reversal of expectations, the power turns the mild-mannered Mr Grainger into a monster. Much of the pleasure of the episode is in watching hitherto unused performance skills from Arthur Brough, particularly a guttural snarl and an absolute confidence in behaving nastily. Having set up this situation, the episode does good work in reversing and rectifying it within half an hour. When Mr Rumbold unexpectedly returns, in one brief - but highly effective - scene Mr Grainger gets sent to Coventry when the entire staff refuse to pass the sugar to him in the canteen. Mr Rumbold's conference then gets relocated to Edinburgh, but Mr Grainger has learnt his lesson and become a considerate boss in the final scene. Its a model of classic three part thesis-antithesis-synthesis structure. Are breasts really particularly funny? I suppose that there's comic potential in how the thought of breasts has the capacity to reduce some man to an infantilised drooling state. But with a lot of these gags it just seems that the viewer is supposed to find women having breasts inherently funny in itself. There are two jokes about them within the first two minutes (one verbal and one visual), which primed me to notice the astonishing regularity with which they pop up... Breasts poking between two holes in a fence, women standing behind pairs of melons, etc., etc. It’s a peculiar fixation. Paul Eddington joins the team in this edition, but doesn't really have much to do. I'm often surprised by just how little film there is in these, as those are the sections that come to mind first whenever I think of The Benny Hill Show. There's only the one sequence in this one, and that's over within the first ten minutes. There's a curious moment of audience response in this sequence when a bowler hatted Hill is in a room with a nubile girl in her underwear. The girl leaves the room and is substituted by a man with long hair and a handbag over his shoulder who approaches Hill. "OHH GAWD!" one member of the audience exclaims, unable to restrain himself at the hilarity of this humiliating reversal. Best thing by a country mile in this edition is a parody of Who's Afraid Of Virginia Woolf? with Hill as both George/ Burton and Martha/ Taylor. As well as the inflections it does a good job of catching some of the tone of the piece as well. I wonder if Edward Albee ever saw it? I really do hope so. Ee bah gum, this comedy is grim in its implications. Young Carter and his bride Pat return back home from honeymoon. The older womenfolk continually quiz Pat for full details of the honeymoon with a prurient fascination, while Carter escapes to the pub with the other men at the earliest opportunity, leaving his wife to burn the dinner and turn up in a fury, which the other men see as a rite of passage. I've always found this battle-of-the-sexes worldview much more dispiriting than funny. What does amuse me is watching men and women trying to get along, however haplessly. I find the later Uncle Mort radio series much more enjoyable, maybe because they're on the road and more narrated. The last of their regular BBC shows presents the duo at the pinnacle of their popularity. Their innate likability does a lot of work in getting the duffer patches of some sketches over the line. I think that because so many people associated them with happiness, there was a collective willingness on the part of audiences to go along with them, making their shows a kind of communal celebration of good cheer. The best bit is the most-repeated moment - the famous breakfast dance which mimes 'The Stripper' to various actions with eggs, pancakes, sausages, grapefruit, etc. The section when Eric tosses the eggs to Eric, who then breaks and beats them in time must have taken a bit of rehearsal. I'd forgotten that there are a couple of minutes before the dancing, mostly of the pair dropping things. You'd wonder where this sketch was going if you were watching for the first time. Its something of a surprise that the BBC's top comedy talents at the height of their powers didn't find more impressive musical guests this week. Diane Solomon, who did at least have minor hit albums at this time, sings a song of undying devotion ('Whistle Me') from the perspective of a dog. 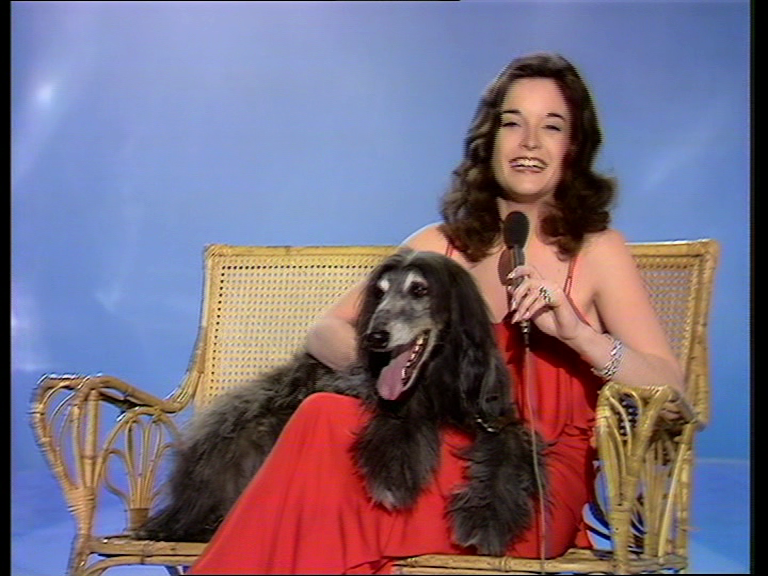 Her performance of the song is wholly upstaged by the large grey Afghan hound sat on her lap - "His name's Kafka. Isn't he lovely?" Top recording artistes Champagne don't even have pets to hide behind. They are a 3M 2F group, but one of the men is a drummer, perched behind his kit of a dais at the back of the set. 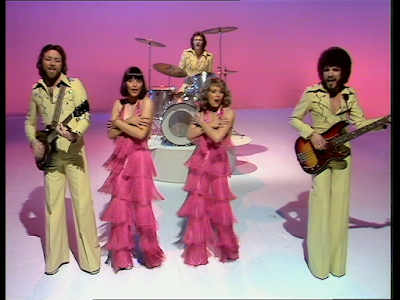 The remaining quartet are lined at the front in a Brotherhood of Man-type formation, but unfortunately the two men (one of whom sports an impressive afro and beard that reminds me of George Berry) are encumbered by guitars, so interaction between the sexes is minimal. The women try to make the best of things by walking back and forth and raising their arms in trousered outfits formed out of six tiers of fringed pink material that flaps about in unison a bit. Their song, 'Love for All Seasons' ("The flowers that we picked in June/ would die too! soon! ", etc.) is unfamiliar and a bit confused.